Charcoal has been used as a fuel in Japan since ancient times, but production declined as natural gas, electricity and petroleum became more common. Even fairly recently, it was very rarely seen in everyday life, but today it is attracting attention again. This article looks at some of the surprising advantages charcoal offers, and how its benefits are being enjoyed in Japan. Cracks decorate the places where the ikeda-zumi charcoal is cut, reminding us of a chrysanthemum (kiku). That is why ikeda-zumi charcoal is also called kiku-zumi. Binchotan charcoal with a dusting of ash. The cut ends display a beautiful sheen. 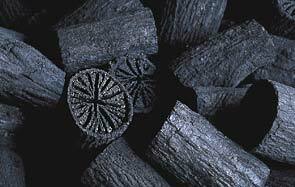 Most charcoal is wood that has been carbonized by partial burning with little air. It has been used for millennia, and scholars say the history of charcoal in Japan goes back several thousand years to the Jomon era. During the medieval period, Japan introduced Chinese charcoal-making techniques that represented an advance for those days, and around the 14th century charcoal was in common use. In the early modern period, Chado (the Way of Tea) took on greater importance, and this led to the making of an even finer variety of charcoal for the tea ceremony. Today, Japan's charcoal-making techniques are admired worldwide. We can classify the different types of charcoal used in Japan into two broad categories: kuro-zumi (black charcoal) and shiro-zumi ("white" charcoal). Generally, black charcoal is soft and retains the tree bark. It is easy to ignite, and burns hot enough for metal smelting and blacksmithing. Almost all of the charcoal produced around the world is similar to this type. To make it, the wood is carbonized at temperatures between 400 and 700ºC, then the kiln is sealed until the burning stops and the heat slowly dies away. One type of black charcoal used in the tea ceremony, ikeda-zumi, is favored for its beautiful appearance. It is made from a kind of oak in the northern part of Osaka Prefecture. White charcoal is made by charring the wood at a relatively low temperature for some time, then, near the end of the process, raising the kiln temperature to about 1000ºC to make the wood red-hot. The charcoal is then pulled out and quickly smothered with a covering of powder to cool it. The powder is a moist mixture of earth, sand and ash, and gives a whitish hue to the charcoal surface. This explains the name "white charcoal." The rapid rise in temperature, followed by a rapid cooling, incinerates the bark and leaves a smooth, hard surface. If you strike it, you'll hear a clear, metallic sound. One variety of white charcoal is made from holm oak, a very hard wood used in kilns in the southern Kishu area (Wakayama Prefecture). 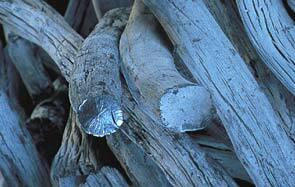 This charcoal, called Kishu binchotan, is considered to be the best grade because it is hard and yields a long burn. It emits plenty of far-infrared rays, which bring out the flavor of broiled foods. Today, more and more establishments serving grilled eel and yakitori (skewered chicken) make a point of advertising the fact that they use binchotan charcoal. Special Feature* Cover Interview What Are These?